The hard copy version of the special report you will receive includes a bound document printed in full color. The report is sent upon receipt of payment. The hard copy and PDF version you will receive is typically mailed and emailed within two business days of receipt of payment. The PDF version of the special report is typically emailed within two business days of receipt of payment. The PDF document you will receive can be used on a total of 10 different computer systems. Once the PDF has been opened on 10 different computer systems that you or your colleagues want to use to view the report it can not be moved, copied or emailed to additional computer systems. The Promo Code for Special Offer you entered is not valid. Please enter a valid Code, or leave the field blank. 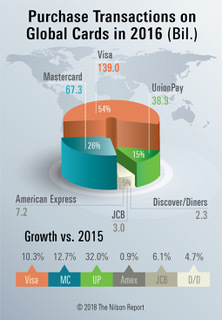 Visa, UnionPay, Mastercard, JCB, Diners Club/Discover, and American Express brand general purpose cards generated 257.17 billion purchase transactions at merchants in 2016, up 13.3% — 30.21 billion more than in 2015. These transactions included all commercial and consumer credit, debit, and prepaid products. Debit figures shown here include prepaid cards. Visa cards include Visa Inc. and Visa Europe, which became a single company in June 2016.